Message from auto manufacturers, green is here to stay. If there was one message that came loud and clear from this year’s Washington Auto Show, its that the future of the auto industry is green. Among the innovative designs was the electric Fiat 500, Fiat’s answer to BMW’s Mini Cooper E, which grabbed headlines last September. Fiat has put a lot of effort into making its new vehicle appealable, launching a cool marketing campaign for the special edition Fiat 500 Pink, by getting a British guy to paint a white car bright pink with 130 bottles of nail varnish! The new electric version of the Fiat demonstrates how the company is diversifying its appeal to new eco-conscious demographics. Among other “hot” vehicles at the Washington Auto Show include the Chevy Volt, Ford Focus BEV and Mercedes Benz F-Cell hydrogen fuel vehicle. Overall, there are some impressive electric and hybrid technology that’s ready to burst onto the American market. Unlike previous electric cars, consumers will not have to take a shovel down to the bank to withdraw mounds of savings just to go green with their motoring. 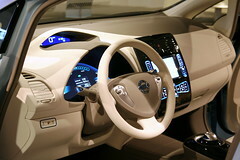 The Nissan LEAF will be competitively priced and affordable, not punishing motorists for trying to be more eco-friendly. Nissan plans to leave the advanced lithium-ion batteries in the leaf to customers, which will make monthly payments comparable to those of a standard gasoline-run vehicle. The auto industry has been rocked by the recession, but despite tough times, its encouraging to see that manufacturers are still taking green issues seriously. The vehicles featured at Washington are testament to this. Long may the green drive continue! How totally cute! And what a great name. I’ve got four kids, plus my husband and I, so I’m hoping for some really great green family cars. Glad they’ll come up with more reasonable prices. I bought a prius in 2007 and it was almost 15K more than any other car! We need to go green! Love the idea, but have to be a spoil sport: where’s the energy saving overall if EVs have to be charged for 8 or 16 hrs? When the majority of drivers have them, won’t that put more pressure on an already overloaded power grid? Or are we banking that by the time that happens, everyone will have solar panels on the carport or a wind turbine in the back yard? Just askin’. Joanna – you asked a question that the EV manufacturers, utilities and local government have already considered. Charging will require a smart grid. Also, many people will charge during the day when they are at work and grid demand is lower. Many organizations are planning “Park and Ride” facilities and parking garages with solar panels installed, so that you literally are using solar power, even if you don’t own your own panels. 8-16 hours? Nope – more like 5-8 hours, which is still high now, but that will be coming down soon, as well. Keep asking the hard questions – that is how we’ll successfully move more people into EVs and away from gasoline power! Great report Stephanie. The only question is: Will Nissan be able to make them fast enough? Let’s get off oil! Excellent question Glenn – enough talk! Let’s get these EVs on the road! Whoever appreciates an honest industrial ethics in defence of intellectual ownership should spread out the history reported in my blog. If the industries can afford unpunished to copy the ideas and defending it need very expensive legal action, to which target need the patents? How our young people can find intellectual courage if the economic potentates crush the rights of the single ones? whoever has a good idea on as I could act for defending my rights I beg him to leave a comment in my blog. Thanks and good time to everybody. Considering a New Car? How About a Green Car Loan! Please, Santa – Bring me a New Hybrid Mercedes! Why Won’t Toyota Electrify Your Ride? How do you Install Solar Panels on a Roof?